While composer Gustav Holst (1874-1934) is best known for his orchestral suite, The Planets, he also composed quite a bit of choral music, including several hymns. (Three of his compositions or arrangements are in our Hymnal, but the only one we regularly sing is his setting of Christina Rossetti’s “In the bleak mid-winter.”) Holst was conducting village choirs and choral societies by the age of eighteen, and during his studies at the Royal College of Music, his teachers included Charles Villiers Stanford (1852-1924) and Hubert Parry (1848-1918), two giants in the Anglican choral tradition. Although he spent six years as a chorister in the Christ Church Cathedral School in Oxford and subsequently wrote works for Anglican services, composer William Walton (1902-1983) is also best known for orchestral works and his scores for films, ballets, and plays. As David Trendell notes, “Both composers were attracted to the long tradition of the English Carol, and in keeping with contemporary ideas, such as the rediscovery of folk-song, medieval texts and the idea of an English musical renaissance, they moved away from the sentimental Victorian conception of the carol to a purer form.” That commitment is evident in the 1987 album Make We Joy: Christmas Music by Holst and Walton, performed by the Christ Church Cathedral Choir, Oxford, conducted by Stephen Darlington. 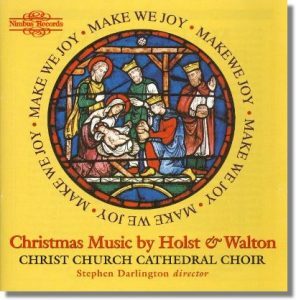 To hear what that commitment sounds like, consider Walton’s setting of the fifteenth-century carol, Make we joy, composed on commission by a Manchester newspaper, which first published it in 1931 (my, how journalism has changed). Gustav Holst’s setting of Personent hodie (“On this day”) was written in 1916-17 for a music festival that he ran. The text and tune are from the influential collection Piae Cantiones (1582). Another carol setting that Holst wrote at about the same time, Lullay, my liking, is based on a fifteenth-century carol. Many of the arrangements presented on this album were innovations that have since become part of the standard repertoire for choirs. Also included here are Holst’s rousing Masters in this Hall (a poem by William Morris) and his triumphant setting of George Herbert’s Antiphon (“Let all the world in ev’ry corner sing, My God and King”). Other pieces by Walton include his 1972 Jubilate Deo, which is technically not a Christmas piece, but of course, confidently singing “O be joyful in the Lord” is surely right and meet at Christmastide.